Traditionally, when someone enters a room, the people already in the room stand and greet the newcomer. It is a respectful and welcoming gesture signaling acknowledgment of that person. Standing up is what we do when someone comes into our space, whether it be our home, office, or any definitive space that is ours. If more sitting is to be done, we wait until the other person is seated. 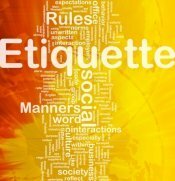 This etiquette rule is still in force today, but it is evolving in some ways. In today’s world, gender differentiation in rules for knowing when to stand are disappearing. The etiquette applies to both men and women. No longer may women remain seated when being introduced. It used to be that males stood when women stood, even as they left the table when dining. When a lady returned to the table, men would stand or mock stand again, sometimes helping her with her chair. On dates, rules still exist for standing up, as well as helping your date out of the car and opening doors for her. When you are dining out on a first date and your date needs to leave the table, be generous with a gesture of standing. If your date does not prefer such treatment she will no doubt tell you and then you may cease. I suspect the evolving etiquette rule may be that the significant other stands up for "their person," regardless of gender. I would caution, though, in some circles people do consider it customary to stand when a woman enters the room. If others with whom you are interacting do, then it is wise to follow suit. Standing up at a friend’s or family member’s home when another person is being welcomed, or comes home after you are already present, is expected. There are also expectations for standing at gatherings, dinner parties, and formal events. 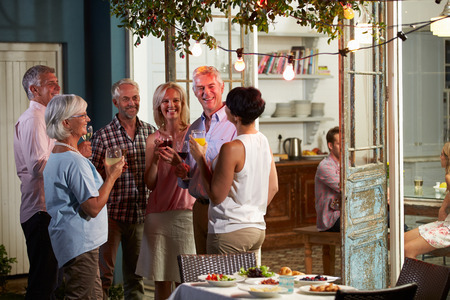 At parties and gatherings, stand and greet anyone who enters the immediate area in which you are having a conversation. Sit when you invite the person to join you or when the conversation ends. If you cannot stand, let the person you are greeting know why as a way of apologizing, "Sorry, it's a bit crowded here," "My sprained ankle won't let me stand very quickly," etc. 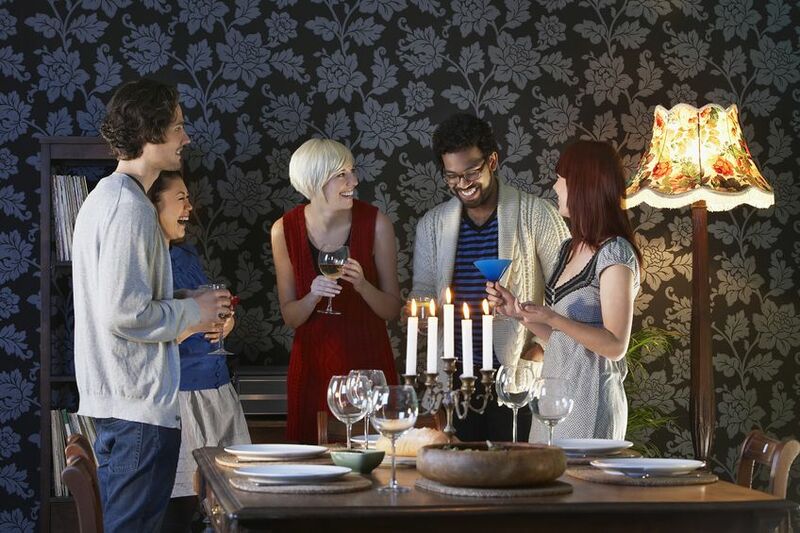 Before sitting down to dine, remain standing behind your chair until invited by the host to be seated. At gala dinners and sit-down coursed dining events, remain standing until you have met everyone at your table unless there has been a clear signal given that everyone may be seated. In formal situations there will be a clearly stated protocol - somewhere. The hosting organization should have information, but you may need to ask for it. It is likely that if you are attending an event where a dignitary will be entering the room, you will know when to stand up. Other precise protocols for standing will be made evident, but if you have any doubts, it is always appropriate to ask. The really nice thing about standing up to greet someone is that you get to see that person face to face. That can mean a lot. Physically, standing up to greet another person opens your body to free-flowing energy, deep breath and all the possibilities of good posture. I haven’t found another country in which it isn’t appropriate to stand when being introduced. Greetings are often people’s first impression of others and making a good impression is important not just at home and at work, but everywhere you go. This week my husband and I were at a coffee shop with a guest who was staying at our home. A person who came into the coffee shop recognized my husband, waved, and came over to greet him. My husband stood up, shook his hand, and introduced him to me and our guest, but we did not stand. It was clear by the situation that he was only stopping at our table to say a quick hello to my husband. In public places, particularly restaurants and cafés, you not only consider the person you are greeting, but the other people in your vicinity. There are times when eye contact accompanied by a nod or wave are appropriate. When you're out with friends at a restaurant, café, or coffee house, someone you know may come in and you notice he is looking for a place to sit. If the group decides it would be welcoming to invite him to sit with you, one person should stand up and walk over to invite him. Even if he declines, he will feel included. But shouting an invitation across the room wouldn’t be received in the same way. Whenever someone offers to shake your hand, do stand up out of respect. Avoid remaining seated. Warm eye contact is a steady companion to both handshaking and standing for a greeting. Standing up is the non-verbal part of the welcome or greeting. It is often an expression of gratitude that you’re glad to be there.